This is a beautiful versatile top that has been designed to be worn during pregnancy and also for after your baby is born, with handy front stud openings for easy access for discreet breastfeeding. 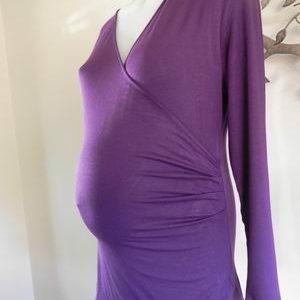 It is by Maternity Plus, NEW with tags and is a lovely stretchy cotton blend. The top has long sleeves and subtle rouching at each side seam. Be the first to review “NEW Stretch Knit White Maternity Top with Front Opening” Click here to cancel reply.